Grandma’s Kitchen intergenerational program was completed and delivered this past fall by a local resident through the Sun City Grand Woodcrafters Club. 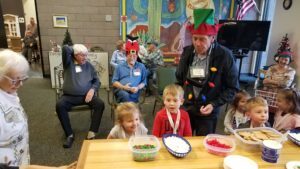 Since then, the children at Wirtzie’s Preschool and Childcare have been busy enjoying lots of wonderful cooking, baking and other fun projects with the “grandmas” and “grandpas” from Lucy Anne’s Place Life Enrichment Program. Benevilla’s Intergenerational Program offers daily planned, intentional activities during which children and older adults come together to grow, learn about themselves and others, and form relationships that can be life-changing. Imagine being a child sitting next to a “grandma” or “grandpa” and learning how to play bingo, make bread together, or create puppets and put on a show. Studies have shown that children participating in Intergenerational Programs demonstrate higher levels of social acceptance, willingness to help, empathy and ability to self-regulate. Our deepest appreciation to the Sun City Grand Lady Putters for your support and partnership on this project! For more information on Donation Opportunities, click here.